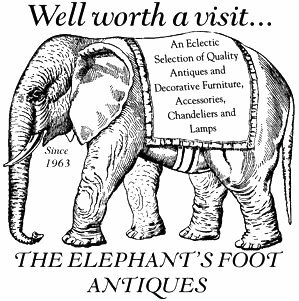 Description Since 1963, interior designers, architects, and private collectors have relied on The Elephant's Foot Antiques for the best available selection of antique and decorative furniture, lighting fixtures, mirrors, and accessories. A vast, eclectic selection of American, English, European, and Asian antiquities and accessories awaits you in a 6,500 square foot showroom. Quality~Value~Selection.